LARCHMONT CHRONICLE advertising director Pam Rudy gets a surprise pre-Valentine visit. Pierre Debbaudt is center, with Patrick Kellogg to his left, and Dr. Bill Boeck is far right. 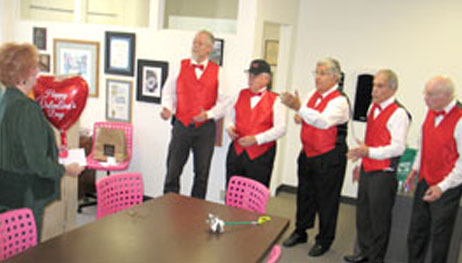 Surprise your loved one with a Singing Valentine delivered by members of the barbershop quartet, the Santa Monica Oceanaires. Members include locals Bill Boeck and Pierre Debbaudt, and Patrick Kellogg—a longtime former Larchmont resident. They sing two old-fashioned love songs and deliver a heart-shaped balloon with a personalized card. Orders are being accepted through Sun., Feb. 14 from Hancock Park to Pacific Palisades and the South Bay. Call 323-247-SING, or visit oceanaires.org.